Finally, truth from Anthony Weiner, Democratic Congressman from New York District 9. Let me repeat, Anthony Weiner, a member of the Democratic party, finally admitted that he himself posted the explicit photos and tweets on Friday, May 27th. Weiner has been lying, sexting and posting lewd photos to young women for a long time and this story still has a lot of legs (pun intended). What made this press conference more memorable was that Andrew Breitbart, who broke the story on his BigGovernment.com site, was in New York to promote his new book and was merely attending the Weiner Press Conference to bear witness. Suddenly, the press saw him and asked him to go up to the microphone and answer questions. 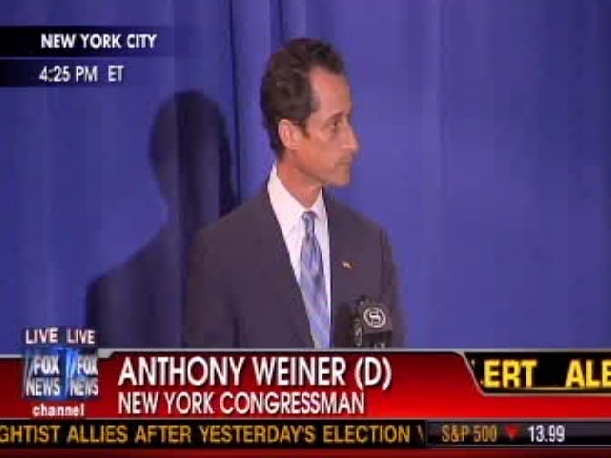 While Andrerw was taking center stage, Weiner’s staff were in the halls, in total panic, yelling, “Breitbart is here! Breitbart is here!” This was definitely where the Conservative movement was finally trumping the vile left. But Weiner’s mea culpa is also a defining moment for those in Washington in the Political Class to begun a purge of all the corrupt, lying and despicable creeps and perverts that haunt the halls of Congress. Let’s start at the top with Nancy Pelosi, and Harry Reid, then Charles Rangel, and yes, Anthony Weiner — they all should resign and be under criminal investigations. After Weiner’s sob session before the media, Nancy Pelosi called for an Ethics Investigation. This is pure kabuki, an election stunt designed to take the stink off of a bad week that quashed the Democrat’s plan to demagogue the Republican’s Medicare proposals, right up to November 2012. This is a great moment for the Republicans to get aggressive and start fighting for the American people. This is the Tea Party’s rallying cry to get out there and convince the independents to defeat all the Democrat incumbents. If we can’t take them down Breitbart-style, then we can do it at the ballot box. Stand tall, speak out and kill ’em with facts. “We have now entered the first full-fledged Alinsky presidency. And the only way to beat Alinsky is with strength. We don’t fight fair; we fight righteous. The Democrats and President Obama will not give up their tack or their tactics. Do you think the GOP will win if it’s strategy is to apologize for every media-manufactured “right wing” outrage? It will not. We will win the day by using all the tools in our arsenal to fight the tyranny of those totalitarian ideologies that have been visited upon us from overseas, where the same ideologies caused only chronic human misery. I think Andrew Breitbart proved that definitively, today. As always, excellent. It is so refreshing when I come over here, serious business!